My paternal grandmother enticed squirrels close to her house: she tied a shallow tin can in the hackberry tree next to the side porch with a piece of baling wire, put a few shelled pecans in, and waited patiently inside the window, her .22 caliber rifle lying across her calico-aproned lap. No squirrels were going to ravage her peach orchard and vegetable garden as long as she could wage her protracted war with them. On a summer day when I was about ten (and she was about 78), she took one of the little carcasses to the backyard, skinned and gutted it, and then fried it like chicken and served it to me with speckled gravy for lunch. But my earliest memories of Grandmomma are of her feet, rhythmically working the treadle of her sewing machine. She wore black lace-up shoes and tan colored hose rolled down to her ankles as she powered each stitch. Sometimes she’d let me push the treadle for her with my hands as I lay on the floor beside her. Grandmomma made all of her clothes on that oak Minnesota Model A machine until the late 1970’s, when she was almost ninety years old and her eyesight had diminished a bit. 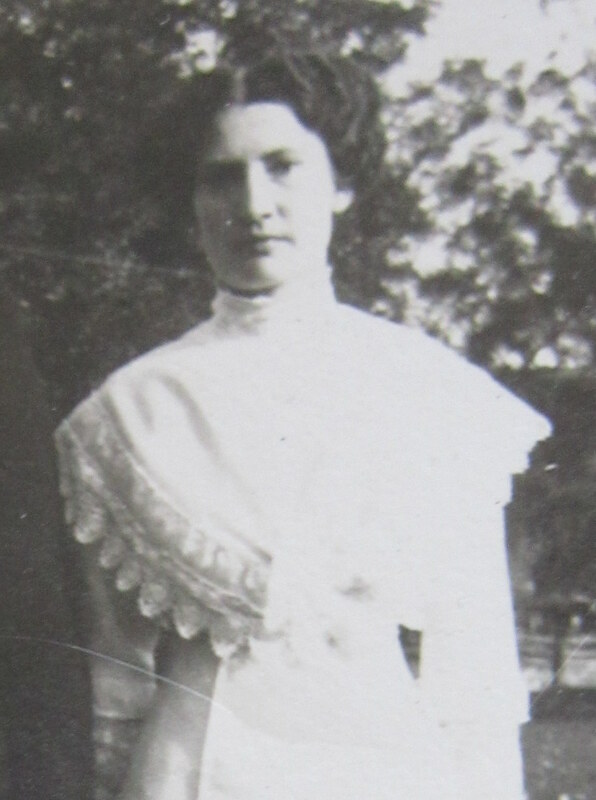 She married my grandfather in 1912. They ordered a wardrobe, a bed, and the sewing machine from Sears Roebuck to set up housekeeping; they picked up these necessities at the railroad depot twenty-six miles away and brought them back over rough road to their Texas hill country homestead by horse-drawn wagon. She was a small woman, standing barely over five feet and weighing probably 100 pounds. When she tended her garden or cared for her chickens, she always wore a bonnet, and her skin looked much younger than her age when she died peacefully in her sleep at 92 (in 1980), never having been admitted to a hospital in her life. Her three children, as was the custom then, were birthed at home with the help of a midwife. When I was a child, our homes were only a half mile or so apart, and I often walked over to spend the day with her. On the way, I’d pick some wildflowers which grew along the edge of the caliche road in front of her home, and Grandmomma would graciously accept them as if they were a precious gift and make a show of arranging them, using a jelly jar as a vase. Her birthday is July 11, and this one will mark 125 years since her birth in 1888. But her upcoming birthday isn’t the only reason she’s been on my mind. Here in the hill country, the mountain pinks are blooming. They’re the very color of nostalgia. Describe your grandmother or another person from your childhood. What objects remind you of those early memories? Do flowers or plants of a certain kind remind you of someone? Tell the story. This entry was posted in flowers, happiness, human stories, landscape, Texas hill country. Bookmark the permalink. shoes. They could both be my Aunt Teddie’s. Thank you so much, Eunice. I so appreciate your reading and commenting. I use the sewing machine as a nightstand and keep Grandmomma’s shoes on the treadle as a reminder of her. She saw so much change in her lifetime, 1888-1980. There’s much more to say about her, and the hardest part of writing this post was deciding what to leave out this time. I like knowing she had a counterpart in your Aunt Teddie in Montana! Chris, you have perfectly described my paternal Archer grandmother who grew up a Denton on Upper Turtle Creek ( with her sister, Lili Buj’s grandmother). And many great aunts of that generation, who wore those same shoes with tan stockings rolled down to the ankle. I picture your grandmother sitting waiting for those squirrels. In a straight backed chair, her legs at a 90 degree angle and both black shoes plaanted firmly. The same posture of Grandmother’s as she sat with a thick grey crock between her skirted knees as she shelled peas. 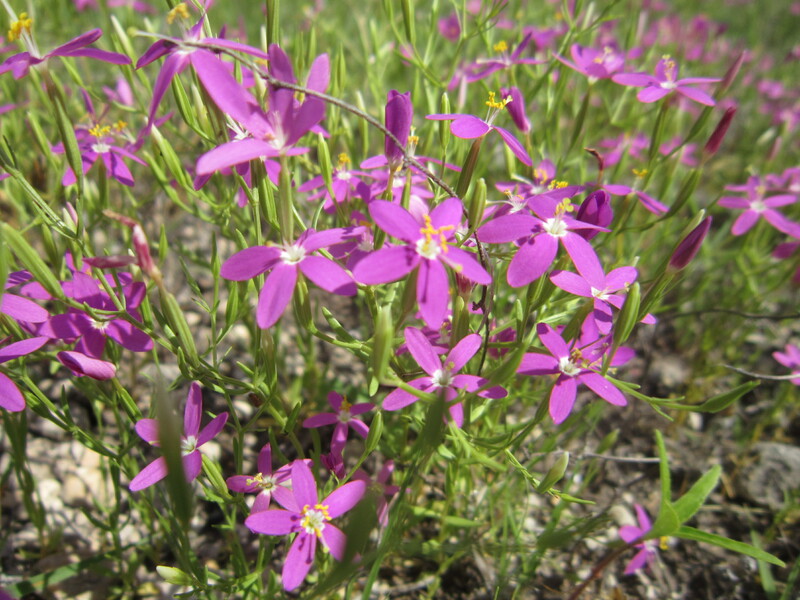 The mountain pinks are reminiscent of flower sack prints. Another Texas county surname in your background! Are there yet more? You are steeped in Texas history. Yes, the stockings were tan, and yes, my grandmother also always seemed to be shelling peas or beans or peeling fruit to make preserves. Her hands were seldom idle. I’m so glad you shared your own grandmother with me. Thanks, Jeanie. Thank you, Anne, for sharing those descriptions of your own grandmother. And the food . . . The memories of food from childhood are still so strong for me. Loved this blog. It reminded me so much of my own grandmother and her treadle sewing machine. I’d sit underneath her feet and watch in fascination. I’d beg her to let me try it. She, too, was only five feet tall, but still holds a large spot in my heart. Nancy, thank you so much for reading and commenting. I wonder how many hours our grandmothers spent at their treadle sewing machines–and in their gardens and kitchens. I’m so glad this post brought back memories for you. Chris, This is just an awesome post – I was fortunate to know both my grandmothers well and I do appreciate your evoking wonderful memories for me. It means so much to me that you like this, Pat. I’d love to hear or read more details about your own grandmothers. The stories of women’s lives need to be recorded, I believe, before they are forgotten. Thank you for reading and for commenting! Chris, I like to imagine your Grandmomma’s 26 mile trip to the railhead. Do you think that would have been a 2-day trip, returning home on the 3rd or 4th day? Perhaps they camped out overnight, sleeping under the stars by a creek, or stayed at the home of a neighbor rancher, where the isolated folks would have enjoyed catching up. I hope their wagon seat had springs, & I wonder what time of the year it was & if the weather held. And who cared for the livestock back at home? So many details of daily rural life under the Texas sun. I’ve wondered those same things, Jeanie. I was just told they brought the items home by wagon. It must have been a very long day if the trip was done in one. Thanks for reading! Thank you, Chris, for evoking such lovely memories of our treadle sewing machine . . . not my grandmother’s, for I knew neither of them, but my mom’s which was used industriously in my younger years. Paula, it’s wonderful to think of your reading this! I miss you so here in the hill country. Thank you for taking the time to read and to comment. 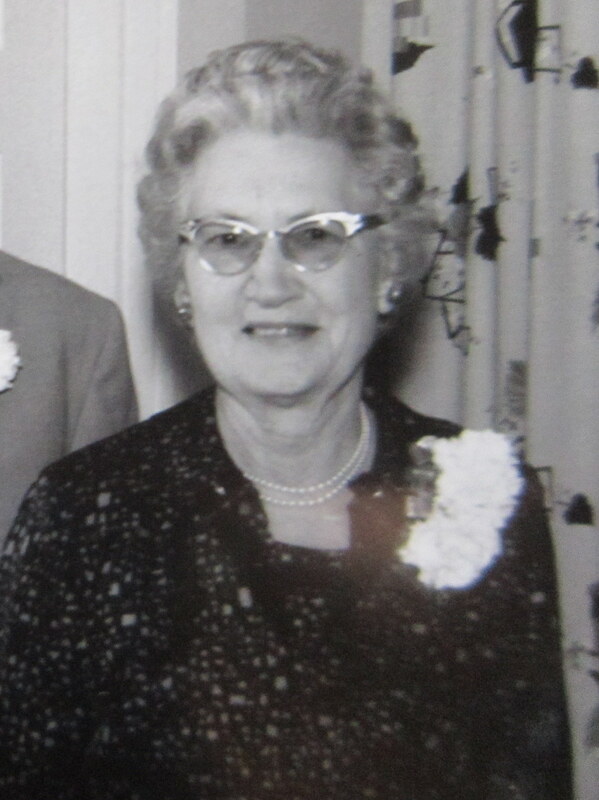 My great grandma liked violets, and she wore a lot of purple pantsuits. You know, the polyester kind. She also had some cute sweet glasses just like your grandma did. She weeded the garden by squatting down and duck-walking the rows, something many young people couldn’t do. She was beautiful, and she wore her long silver hair in a perfect bun. She would take her false teeth out and make faces for me. If anyone burped after a meal, she said “Excuse the pigs, the hogs are out walking.” Usually she was the one who had burped! She was a funny girl and we got along like best friends. I love this, Kristin! Maybe you inherited your delightful sense of humor from your great grandma. It makes me happy to know you’re reading this blog and using your writing skills. Hugs to you. Grandmomma had blue hair also. It’s funny–I think her hair was probably a beautiful color underneath the bluing. I remember the squeeze bottle that stuff came in and can almost feel it in my hand. Thank you, Linda!